Archer's 9th and 10th seasons will also be shorter: just 8 episodes a piece. In a recent Murmur Podcast (via Polygon), Archer series creator Adam Reed laid out his plans for the end of the series. Even though Season 8 has yet to begin, Reed already has plans for a 9th and 10th season, which will be the series last. Further more, for those of you hoping that Season 7's reduced episode count (10 instead of the usual 13) was just a one-time thing, i'm afraid it's going to get worse, as Reed wants to have even shorter seasons going forward. "The plan is to end Archer after season 10," Reed said. "I don't know that anybody has talked about that, but that is definitely my plan - to do eight, nine and 10. They're going be each shorter seasons of just eight episodes, and then wind it up. "I was gonna end it after [season] eight, but then I had sort of a brain explosion of a way that I could do three more seasons and really keep my interest up. So, the three seasons that are coming up are gonna be pretty different from what has come before, and they're gonna be different from each other." It sounds like Reed has some distinct story-lines thought up for the upcoming ArcherSeasons. We may even see something like the 5th season's Archer: Vice, which saw the team switch from being spies to drug dealers. 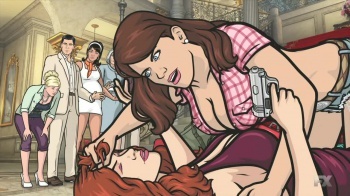 Season eight of Archer is set to premiere on the cable network FX in January.